Rhododendron is a beautiful tree well known for its spectaular flowering and being evergreen it is useful plant in the garden. Rhododendron ponticum is an exotic Victorian introduction that became, and still is, a very poplar ornamental shrubby tree widely planted in gardens. It is native to Mediterranean countries from Portugal to Turkey. It is also found naturally occuring eastwards from the Mediterranean through Asia into China. It grows quickly, propogating very effectively by the lateral branches rooting wherever they come into contact with the soil. It also seeds prolifically. 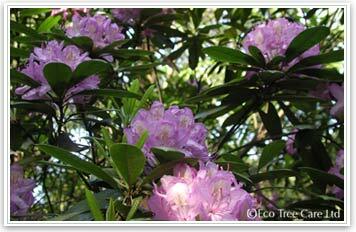 Rhododendron has shiny, waxy leaves that repels herbicide treatment. Consequenly it can be hard to get rid of and can take a conserted effort, sometimes over years to eradicate, or at least bring under control. 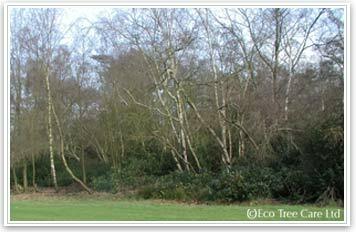 A characteristic of woodlands overgrown with Rhododendron is that they are low in biodiversity. There are few nut and berry producting understorey trees such as hazel, hawthorn, viburnum and blackthorn and because of the dark woodland floor very little ground flora, mosses and grasses. 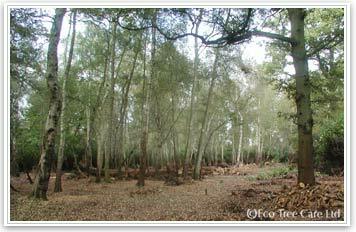 Compared to 'normal' woodlands there is a huge deficiency of wildlife. In the region in and around Potters Bar in Hertfordshire are pockets of acidic green sandy soils in a area characterised by otherwise heavy clay. This geology has been attributed to the debris carried by the meltwater from the ice sheets of the last ice age that extended south only as far as this region. Rhododendron, as stated above, only thrives on ericacious acidic soils and therefore has become invasive in some of the woodlands in this area of Hertfordshire. 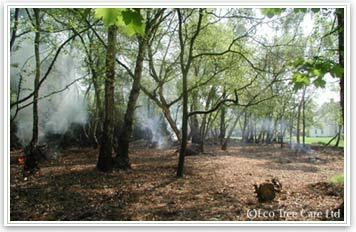 A woodland owner in Potters Bar had a particular problem with his entire woodland. 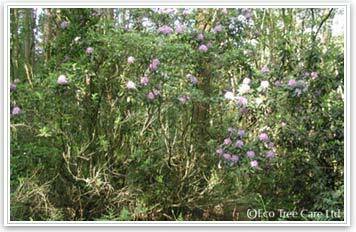 It was completely impenetrable, overgrown with thick Rhododendron growth. The native trees were unable to naturally regenerate as the woodland floor was too dark. Over time, if left, the woodland would become only Rhododendron. There was no ground flora and it was not on an ancient woodland site so there was no obvious constraints. 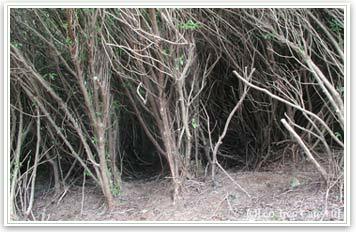 The above photos show the edge of the woodland, as can be seen it is an impenetrable sea of dark green Rhododendron trees up to approximately 4m (12ft) high with stem diameters at ground level of upto around 300mm (1ft). 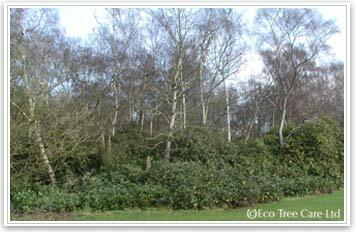 The area of the woodland was approximately 5 acres and in 2006 we were tasked with the removal of the Rhododendron without damaging the native woodland trees and leaving deadwood where we found it. We had to work around nesting season and periods when it was too wet where damage to the woodland floor would be too great. 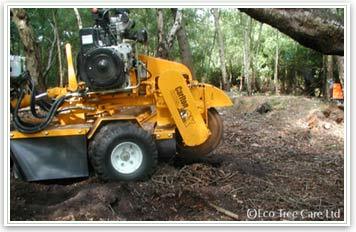 Rhododendron control is sometimes achieved by injecting herbicide into the cut stumps, on this occasion the owner asked us to remove the stumps completely using a stump grinder. 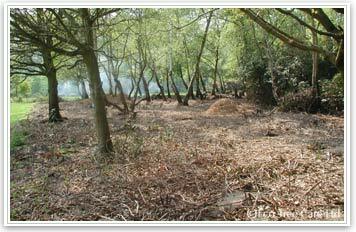 Brash was chipped to prevent re-rooting, the woodchip spread out and the wood was converted into logs for firewood. 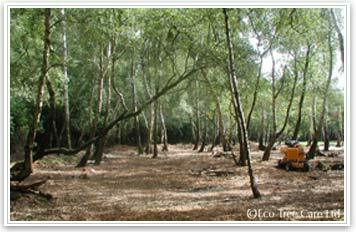 The photo above left shows the woodland floor immediately after cutting. The many layering and rooting branches can been seen in the foreground. Each one of these stems was individually hand pulled to remove the stem and roots. These were then collected together and burnt as they could not be chipped. 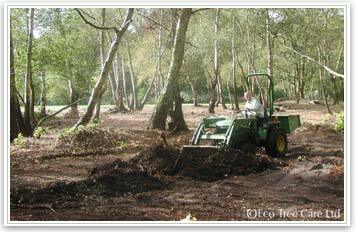 Finally we were asked to create a track into the woodlands and eventually the work was finished in 2007. 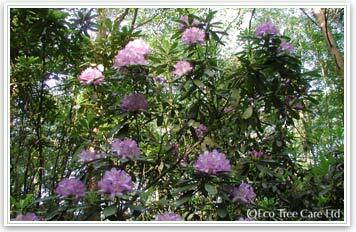 There has been virtually no Rhododendron re-growth, any found could be hand pulled by the owner. New trees were planted and the woodland floor has now started to be colonised by native flowers and plants. Rhododendron control is a severe problem in some areas of Wales. Over years Rhododendron has been left to grow unchecked and has colonised many woodland often in hard to reach difficult terrain. 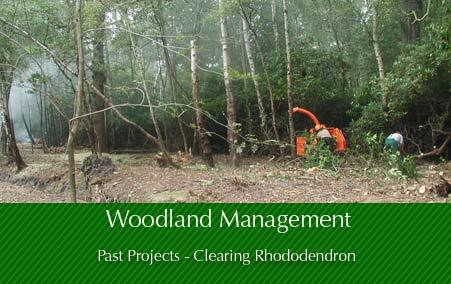 We were asked by a woodland manager to start the process of Rhododendron control in their woodlands and come up with a best practice managment plan for the terrain and resources available. It was clealy going to take many years and would involve the intensive use of local contractors. 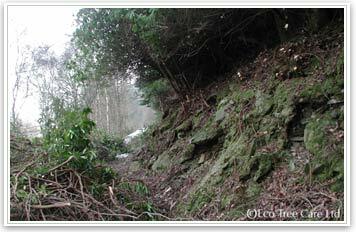 The first job was to reclaim the rides to enable access into the woodlands to be able to properly survey the terrain and extent of Rhododendron colonisation. 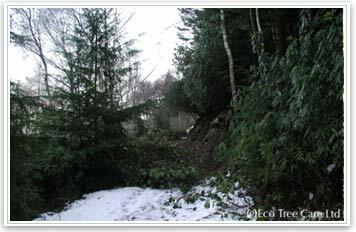 Along with the track clearing, additional areas were cleared to act as buffer zones to check the further invasive spread of the Rhododendron and to break the woodland into areas that could then be managed on a local basis to over time be cleared.